Open: Tuesdays, 9 a.m. to noon. Thursdays, 9 a.m. to noon. 2nd & 4th Saturdays of each month, 9 a.m. to 2 p.m. THE EXHIBIT IS NOT OPEN WHEN IT IS RAINING OR WHEN THERE IS PUDDLING FROM A RAIN WITHIN THE LAST 24-48 HOURS. Queen Califia's Magical Circle will be open to the public Tuesday and Thursday, 9 a.m. to noon, weather permitting. The Garden will be closed on weekday holidays. The Garden will also be open to the public on the 2nd and 4th Saturdays of each month, from 9 a.m. to 2 p.m., with docents available to answer questions. Information, including hours and directions, can be obtained by calling (760) 839-4000. The sculpture garden's key architectural features are an undulating circular wall measuring 400 feet in length (with varying heights from 4 to 9 feet) that surrounds the garden. 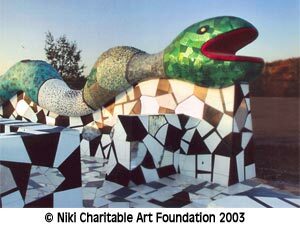 Monumental playful serpents, decorated in colorfully patterned mosaics, slither along the top of the wall, their curved bodies forming a pattern of solids and voids that allows visitors to see landscape vistas beyond the garden. The "snake wall" opens into a maze whose walls and floors are covered with black, white, and mirrored tiles. Once through the maze, visitors enter into the central courtyard. There are nine freestanding sculptures in the garden. The imposing mosaic sculpture of Queen Califia standing on the back of a five-legged eagle commands the center of the garden. Eight large totemic sculptures surround Queen Califia. They are covered with symbols and forms freely drawn from Native American, Pre-Columbian, and Mexican art as well as the artist's own fantastic imagery. 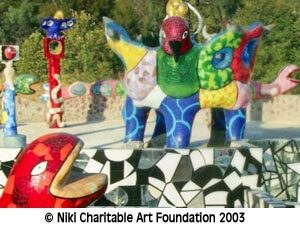 Niki de Saint Phalle Including films such as "Queens Dream."